When it comes to great expectations you should be thinking Charles Dickens, but instead it seems the vast majority of Redskins fans have RG3 leading Washington to a Super Bowl, a mission to Mars, directing Godfather 4, winning every single track and field goal at the Olympics and being on the cover of Madden 14. Lets all remain calm and wait for some pre-season football before even writing the first chapter of what is hopefully a very thick book. 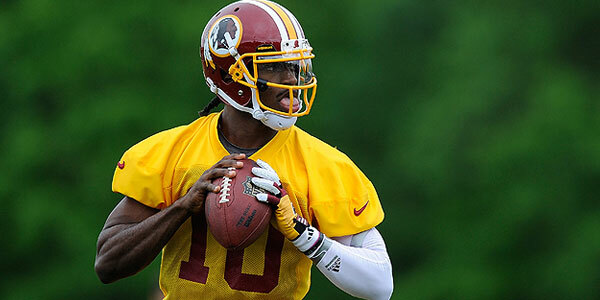 Two positives have already taken place to this point – firstly RG3 has signed his rookie contract and secondly he hasn’t been arrested. I swear I read on Twitter that there has been 26 known incidents where idiotic NFL veterans have been arrested this off-season. On behalf of all the mortal people in this world who are not paid millions of dollars to wear an NFL uniform can those that do please grow up and learn to be responsible. Now I could almost understand some NFL vets being idiots last off-season as we were in the middle of a lockout, but this year there is no excuse for drink driving, hitting your mother or doing anything that involves the police writing your name in a little black book. NFL athletes should take a few pages from Great Expectations and read them, after all the protagonist was an orphan who at least knew right from wrong.